Yes the 0 stamina may hurt but given the fact that they throw PvP gear at your head for simple participation you can always equip your PvP gear when stamina is really necessary. Giving up 28 spirit for 65 haste should be an easy choice even for the most spirit devoted healing Priests. So my question remains, why do these exist? These look more like Discipline Priest gloves than Shadow or Holy. You get so much spell haste as Discipline that you really don't need any spell haste added to your gear. Between Power Infusion, Borrowed Time, Aspiration, and Enlightenment, you get an average of like 12% spell haste at all times. I'll definitely be making these over the Spellweave Gloves. I haven't seen any fights so far on Beta that really require spell haste for healing. 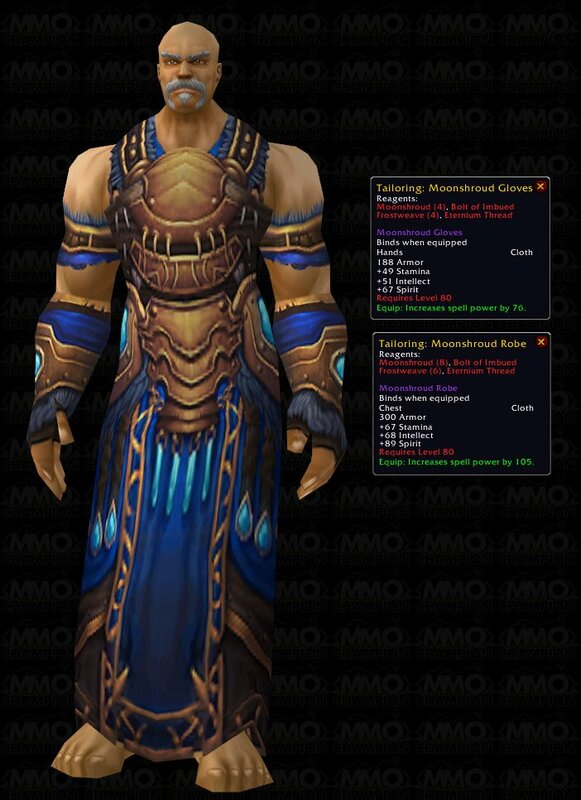 Warlock with Fel Armor will gain extra 20.1sp from this piece. Consider farming the Overlook Handguards instead. It is a 20% droprate from the final boss of heroic Drak'Tharon Keep. The stats are nearly identical; the Overlook Handguards have shifted one point of spirit into spellpower. If you don't want to spend the time farming the Overlook Handguards or have miserable luck with drops these are an easy alternative that you can "Farm" up in an AH. These gloves are great for heroics and early raids in Northrend. If you are hit capped, these would be a nice increase in DPS for affliction locks since Fel Armor scales with spirit. Work out the price of the raw materials, and compare them to the price of the finished product on the AH. There will always be someone selling a crafted item for cheaper than the price of mats just because they made it for skill-ups. For example, Ebonweave goes for 400g apiece on my server, and when I saw the Ebonweave gloves on the AH for a 600g buyout, I jumped on them. That's one less piece of gear that I'll have to farm for on my priest, allowing me to be a viable raider sooner after I hit 80. Bottom line: If it's a great piece of gear you can obtain for reasonable effort, there's absolutely no reason to get it to boost your raid's effectiveness. It is Infinite dust u need to make bolt of imbued frostweave, not arcane dust.